When I begin devising a new Blogger template design, the first thing I do is look for inspiration. CSS galleries and design showcases are among the first places I visit to be inspired, but one thing I have noticed is that there are rarely any Blogger powered designs on show! So over the past few weeks, I've been searching for the best Blogger powered web designs to provide a source of inspiration particularly for those who use Google's Blogger platform. In this article you will see 54 unique and inspiring Blogger powered designs: some of these seem based on generic/free templates, while others are so far from the generic norm that it was difficult to believe these are powered by Blogger at all! For your visual pleasure, here are these 54 excellent Blogger powered designs, organized by category. I hope you enjoy looking through these designs as much as I did finding them! Powered by Flash (yes, I did say flash! 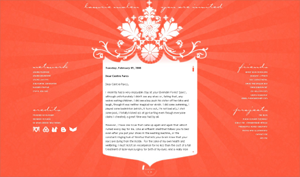 ), this unique Blogger design is truly inspirational. 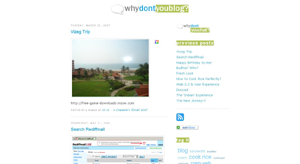 I have never seen a blog quite like this before, much less one which utilizes Google Blogger! 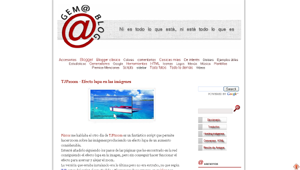 This site is a fabulous example of how Blogger may be used as a CMS (content management system). 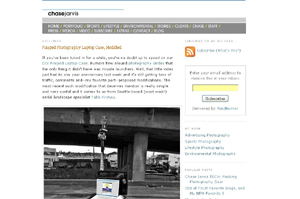 This charitable photography site has been featured in many CSS galleries and uses W3C valid HTML markup. The slideshows are truly stunning and contribute to the overall make up of this beautifully designed site. Kokogiak's design uses so many different functions, including show/hide div animations, Google maps integration, site search... It's wonderfully laid out and one of my favorite ever designs in terms of functionality and a joy to navigate. This section features designs which are clean, simple and well laid out. 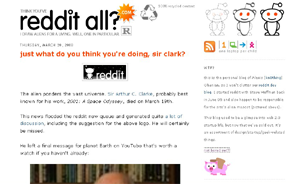 This is the personal blog of Alexis Ohanian (who designed the Reddit alien logo). Never underestimate the power of a simple header image combined with striking images in posts! This clean layout perfectly enhances the educational content of this resource site. It's so easy to find your way around this clean design. The label cloud at the top of the page makes it easy to understand what this blog is all about, while the static link to the top of the page (bottom right) is a touch of classy usability. A clean and professional layout which fits perfectly with the theme of code and development explored through the articles presented here. 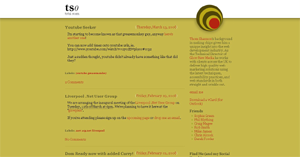 Chase Jarvis' blog was recently featured in Blogger's Blogs of Note. I love how the pale design perfectly sets off the photography and images in the posts. It's well integrated into Chase's complete website, so you can barely tell you are leaving Blogger hosting when clicking on the tabs in the navigation section. I adore the beautiful simplicity of this design. It's so clean and uncluttered, and the placement of every element seems so well thought out. In contrast to the previous set, these designs use darker color schemes to great stylistic effect. 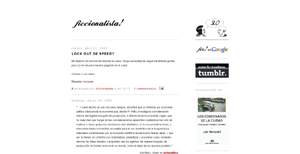 This is a really unusual design, utilizing expandable DIV sections for different areas of the blog. Iran Graffiti showcases urban art caught on camera in Tehran. It really is worth a visit to see some of the stunning designs featured in this blog. This striking design makes great use of PNG transparency and even renders correctly in Internet Explorer. A cynically corporate design (you'd need to read this blog to discover why...) which is pulled off beautifully! The drop down menu and scrolling news ticker really add to the depth of this design. I always love to see how people use the Blogger templates I provide here at Blogger Buster, and this customization is truly an excellent example of what can be achieved with a little imagination! Xiaxue's blog is beautifully designed and is such a great presentation of her personality! This is such a unique and feminine design. 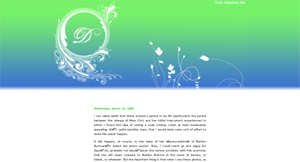 The styling in the header is reflected throughout the template, and the bright colors complement the author's personality in vivid technicolor. A lighthearted design makes this homeschooling blog a fabulous place to learn of this mommy's experiences. This "Mommy Blog" is dedicated to fashionable mummies and their trendy offspring. A couture designers guide to business, life and all things girly. This design is truly a work of art. It seems inspired by 1950's style movie posters and is very eye-catching! A Mere Trifle, My Dear! Although this is quite a busy design, I love the overall theme of nostalgia: everything is drawn together, from the flock style wallpaper to post images and sidebar icons. 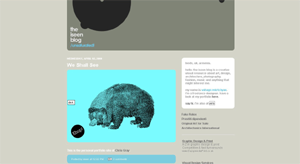 An eclectic combination of old meets new in this striking personal blog design. This section showcases some of the best Blogger powered designs written by musicians, artists and photographers. 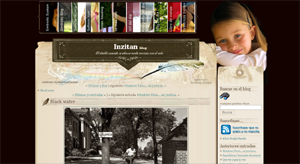 This blog utilizes flash, YouTube and other stylish elements in such a great way! 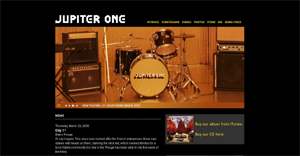 Blog posts provide news to fans of the band, another great example of how Blogger may be utilized as a CMS. 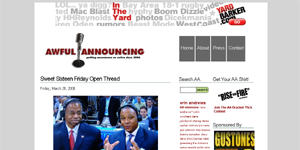 Here again, flash is used in the header section to provide fast loading background music. I love the effectiveness of this simple design, especially the huge "dates" which overlay the actual posting date. The simple backdrop is the perfect canvas to highlight the beautiful artwork showcased here. A striking design showcasing urban street art in Iran. 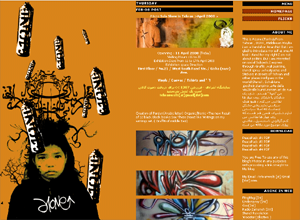 A striking, graffiti style header combined with ultra bright colors in the sidebar creates an eclectic mix. A Manga-inspired blog about design, with intricate attention to detail. An excellent showcase of photography is perfectly enhanced by the Polaroid styling of each individual post. Here again we see how a simple clean layout can perfectly set off such beautiful artwork. Each post is so well designed with each image framed and styled so well. A final collection of Blogger powered designs which were difficult to categorize. All are excellent and inspiring in some way. Thom Shannon's blog screams simplicity, yet is so aesthetically pleasing in structure and form. 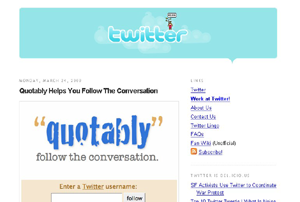 This is the official blog of Obvious, the company behind Twitter. I love the parchment style background combined with the striking red logo. Slick and usable, this blog is branded with Odeo's striking logo and fits perfectly with the main site's theme. This design is so sleek and modern, it seems to ooze professionalism. This design really breaks convention! It's almost as though the blog posts are printed as a label on the jam-jar! This is just one in a series of interlinked "Spoiler TV" blogs written by Dark UFO. 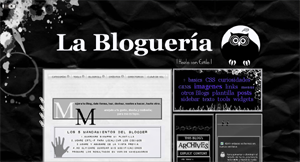 It's really hard to tell that these blogs are hosted by Blogger, especially with the attention to detail, the use of DOM tabs in the sidebar (which change to display recent posts, feeds, stats, translations and so on) and the slick menu bars. Another stunning design by Yo Misma which encompasses the personality of this creative blogger in both background and attention to detail. 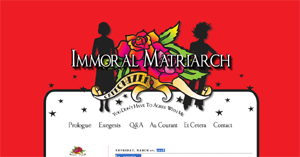 A collaboration of bloggers from all corners of the world whose message is clearly employed in the striking header. Navigation is simple and well styled, while the sidebar sections are well organized and easily distinguished from the main content. This blog has so much personality! Throughout the design and blog posts are funny illustrations, cartoons and such which perfectly enhance the theme of "geeky humor". For me, this Blogger powered design is Eastern inspired bliss! I love the way even each post title is styled according to the theme; blog authors have their portraits framed in the sidebar and the header is just... amazing! The style of this humor blog reminds me of Presidential campaigns, though everything on this site feeld as though it's been placed in the correct area. Even the images and quotes in posts are positioned well. This blog is based on the Magic Paper template, but with a little adaptation this becomes so much more beautiful. By adding the image of the little girl and the flash functionality to the header section, the author has really made this template come alive. 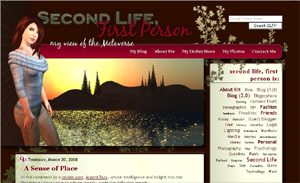 Here is another Blogger powered design based on an existing template. 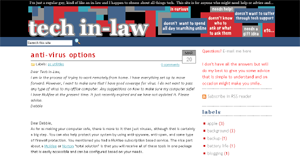 The unique header design goes a long way to explain for the casual visitor exactly what this blog is all about, while the clean content section is easy to navigate. 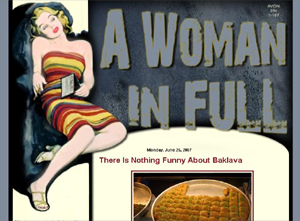 The title of this blog sums up the design completely. Featuring a cool color scheme and no clutter whatsoever, this is a breath of fresh air. One of the things I love most about this design is that even the ads complement the general theme! The over-sized navigation buttons near the header set this apart from others of a similar design. 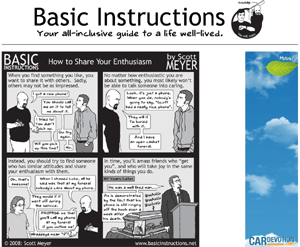 Scott Meyer's cartoons are brought to life online in this hilarious blog! Each post is a self-contained and perfectly crafted piece of art which will have you rolling on the floor in laughter! 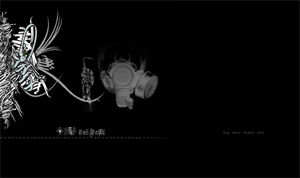 This design is mostly monochrome, with the only elements of color appearing in the footer section as links to Meyer's other sites. Vahagn Mkrtchyan's blog is a creative visual resource about art, design, architecture, photography and more. Each post is almost a work of art in itself, stylized perfectly to match the overall theme of rounded corners, use of color and general style. While writing this post, I came across even more excellent designs and had to delay publishing so I could include these too! I know there are many more excellent Blogger powered designs to be discovered and would love to follow up this article with another in the near future. So if you are especially proud of your own Blogger powered design (or know of another blogger's work you would like to see showcased here), feel free to drop me a line or leave a comment below. If you have enjoyed this post please consider adding this to your favorite social bookmarking service, or subscribe to the feed and receive free updates of new Blogger related articles as they are posted. As always, I would really appreciate your comments and opinions, so feel free to let me know what you think by leaving your comments below.